Do you have any relatives who say that they cook and then they just open cans? Yep, this recipe was inspired by a “Can Chef”. I am always looking for a way to store healthy meal components in my pantry so when I run out of food, time, etc. - a meal is just waiting for me. If you look in my cabinets, you will find cans of black beans and cans of tomatoes. I wish I had the foresight to cook my beans from the dried version because I would save some money. Also, I could control the sodium which is a problem with canned beans. There is about 400 mg of sodium in ½ cup of canned beans. To reduce it, you can drain and rinse them. You can also buy “Low Sodium” canned beans in the supermarket. I’m not sure why all canned beans aren’t low sodium. Diced tomatoes of every flavor can be found next to the tomato sauce in your local store. There is fire roasted, basil and garlic, chili and lime....you name it! The great thing about the infusion of flavors into your can of tomatoes is that you don’t have to buy the basil, lime, etc. I found a can of diced tomatoes that was flavored with cilantro, chili, and lime and added it to two cans of rinsed beans in my blender. WHIIIRRRRR. This isn't just any soup. In one cup, there is 20% of your daily value of iron and 11 grams of fiber. Actually, my husband thought it was dip and started to get out the chips. Hey, stop ruining my healthy lunch! In it’s room temperature form this soup is thick enough to be a dip. Heat it up and you have a hearty thick soup. 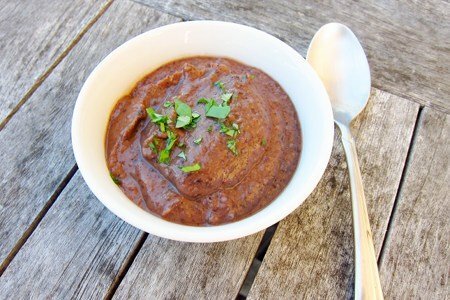 How do you make black bean soup? Please share. Drain black beans and rinse them. Put them into a blender with the can of diced tomatoes including the tomato juice. Blend until smooth. Pour into pan and heat to soup temperature or use a microwave safe bowl and heat. Looks good! Have you ever heard of an immersion blender? I got one for Christmas one year and it's great to make creamy soups. Like you, I'm not a huge fan of canned goods, but keep black beans and diced tomatoes on hand. As a Weight Watcher, I don't know about giving up 5pts for one cup of soup. Hmm. This is so great and simple. I have been known, in a pinch, to whir up a can of black beans and a jar of salsa and call it bean dip.....It is great to have emergency supplies. It is still healthier than fast food. I also usually serve black bean soup on brown rice to complete the proteins. Thank you, Lisa. I've done the black bean- salsa thing, too. You can use Rotel tomatoes, too. This looks good and can't be any easier. I'm going to try this recipe in my Nutriblender that makes hot soup! Sounds yummy. Thanks for the recipe. Canned beans in the store are not low sodium because they don't taste good that way. Cook's Illustrated taste tested black beans and they found that the low sodium versions tasted flat and not very good. Also, not everyone needs low sodium versions. We have no history of sodium-sensitive hypertension in my family, and in fact my sodium levels tend to run low. One-size-fits-all nutrition recommendations like "Low Sodium For Everyone!!" fit as well as a one-size-fits-all dress in real life. This is so easy! Love the 2 basic ingredient-soup creation! Its so easy that I don't mind adding a few steps, that, plus I love to cook and tweak recipes to make them healthier. Call me picky but I try to use BPA-free food whenever I can so I'll use chopped POMI tomatoes and add coriander, chili, cumin, and fresh lime juice. Then because I usually plan my soup-making I'll take you up on the $$ saving tip and soak 3 cups of black beans overnight! Its still a very easy recipe cause no chopping for me! I can't wait to try this with Late July Restaurant-style tortilla chips, maybe a dollop of sour cream (because I'm bad:) and some diced raw green onion garnish! Thanks Lisa! i just made this soup, it is absolutely delicious! It couldn't be any easier! So much flavor for so little effort:) thanks for sharing the recipe. I have in my cupboard now organic canned black beans with a sodium content of 85 mg er 1/2 cup. I discovered a few years ago when checking out beans at the supermarket, that regular beans are high in sodium, 'low-sodium' beans a bit lower, and organic beans wa-a-ay lower. If cost is a factor, you can find them less expensive at places like Big Lots and Grocery Outlet; I stock up when I see them as organic anything is usually more expensive at the supermarket. For your chili recipe, I use low-salt canned tomatoes and organic beans - cuts the sodium count by a lot! When I try this bean soup recipe, I might add a bit of chicken broth to thin it out as I don't need it to be vegetarian. Also like Beth, my immersion blender has been so handy - I remember poring hot split pea soup into the blender in batches, what a mess! Not any more - Snack Girl, you really need an immersion blender :-) Also, I saw the Cook's Illustrated canned bean taste test (don't think they included organic beans?) and decided that I usually use canned beans in a recipe where the taste of the beans is overshadowed by other ingredients (like in chili), so low-sodium is more important than a slight taste difference. Erika, I'm not salt-sensitive either, but I like to be in control - so I taste first, then add only enough salt to enhance the flavors. I cook black beans 2 pounds at a time in my slow cooker and freeze them in 2 cup batches (approximately 1 can). It's as easy as using canned beans for me and I control the salt and everything else. I prefer to add my own seasonings to plain tomatoes, like Barbi above. But the recipe still sounds like a great template for future experiments. I plan to try it. What irritates me is that the reduced sodium beans are more expensive than the regular beans - why are we paying more for something they add? At least there is the rinsing option, which according to what I have read significantly reduces the sodium. But, what makes me mad is that with canned tomatoes, at least at the stores near me, only have the no salt added version in one or two options - like diced but not finely diced, and the flavored tomatoes never offer a no salt added version! Snack Girl, you're a genius!! My toddler and I were starving when we got home late and this recipe saved the day! My veggie-hating little guy loved it and so did I :) We had it with plain greek yogurt and cheddar cheese. Thank you thank you!